My eldest boy has amazing circulation and never feels the cold, he wears short sleeved t-shirts all year round and teases me with my multiple layers. I hate winter with a passion, I feel like Fortycoats, a character from a old children’s tv programme who wore, well, 40 coats. 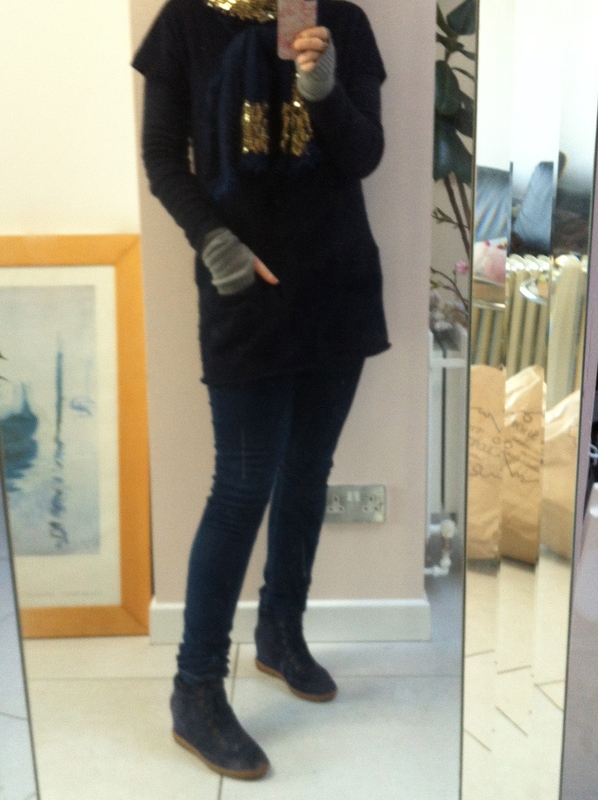 Today I was back on the school run and wore jeans for the first time in about a month. Its is easy to get away with skirts and dresses and opaque tights when the weather is moderately cold but shivering with icey thighs is not a good look, so I will have to reassess my wardrobe. I love the coated DP skinnies that some of the other WornOuters have been wearing but I know just from looking at the cut that they will do nothing for my pear shape. Time for an investigative trip around the shops I think. So my layers today are: silk thermal long sleeved vest, long sleeved t from Topshop, Anya Hindmarch lightweight (but very warm) cashmere jumper, Vince cashmere tunic, 140 denier opaques, Oasis Cherry jeans, Aldo wedge trainers with sheepskin insole (via ebay, I couldn’t live without them), Marks and Spencer cashmere wrist warmers, and a beautiful scarf I bought last year by Sian Jacobs. 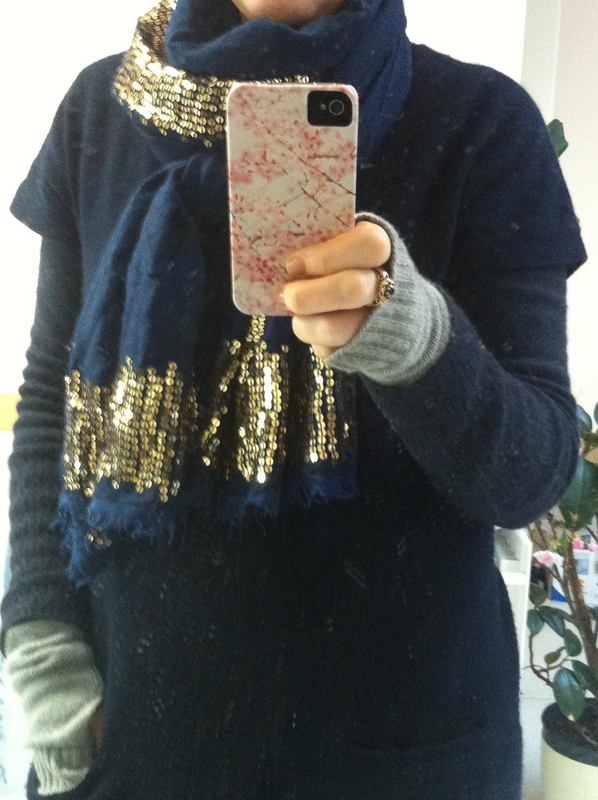 I saw it in a shop window, and (unusually for me as I generally don’t impulse buy) snapped it up – navy and sequins, two of my favorite things, how could I resist! This entry was posted in Outfits and tagged Aldo, Anya Hindmarch, Marks & Spencer, Oasis, Sian Jacobs, Topshop, Vince on November 5, 2012 by Emma WornOut.